In mid-20th-century Oklahoma, when I was finishing high school and starting college as the Second Vatican Council unfolded (1962–65), Catholics represented only 2 percent of the population. There was a steady stream of televised Protestant services, and I remember vaguely a local Sunday broadcast that featured a panel of Protestant ministers. The panel became interesting when, unexpectedly, one of our few Catholic priests appeared on it wearing a Roman collar, when clergy of other denominations usually did not. The visual message was clear—though other Christians are similar to us, we Catholics are different. Despite a healthy preoccupation at Christ the King, my home parish, with liturgical participation and sermons on justice and civil rights in the decade before the council, ecumenism was not on the agenda. Our priests’ liberalism extended only so far. Annually they railed against parents who enrolled their children at the prestigious Episcopal Cassady Day School. Chapel was required at Cassady, and for Catholics that presented a problem. Our priests resisted our parishioners’ attending services regularly in other churches. The “Decree on Ecumenism” undid those reservations and even encouraged Catholics to join other Christians regularly in prayer, especially for unity. In Oklahoma, most of our neighbors, acquaintances and business associates were not Catholic, and the few ecumenical initiatives took place among Protestants. Nationally, the Federal Council of Churches of Christ in America was organized in 1908, which in 1950 gave way to the National Council of Churches of Christ. While the religious freedom created by such Protestant diversity allowed Catholics to flourish, warnings would periodically arrive from the Vatican reminding us to hold discussions of faith and morals apart from Protestant ecumenical efforts. These warnings began arriving as early as 1895, with an expression of displeasure to bishops over Catholic participation in the 1893 Parliament of Religions in Chicago. In 1928, shortly after the ecumenically planned first Faith and Order assembly in Lausanne, Switzerland, Pope Pius XI issued an encyclical warning the whole church about “pan-Christians who turn their minds to uniting the churches” but whose ecumenical effort “tends to injure faith.” Another warning arrived in 1948 anticipating the organizational assembly of the World Council of Churches that year in Geneva. Interaction between Catholics and Protestants and Jews, too, had to take place on the edges of formal church structures. Founded in New York in 1927, the National Conference of Christians and Jews (called the National Conference of Jews and Christians until 1938) was the world’s flagship interfaith organization. Yet Catholic priests had to justify any involvement in the conference. The Paulist John Elliot Ross, who served on the N.C.C.J. executive committee, was also the first priest to join a Protestant minister and a rabbi in cross-country speaking tours. Father Ross defended himself by distinguishing interfaith activities dedicated to eliminating prejudice and promoting the common good from discussions on Christian unity, faith and morals, which were banned. By 1950 the Vatican gave qualified acceptance to the assignment by bishops of “trustworthy and sufficiently educated priests” to attend ecumenical meetings as observers. Even before that, in 1948, the bishops of Holland allowed Msgr. Johannes Willebrands to develop ecumenical relations there. In 1952 he and the Rev. Frans Thijssen formed the Catholic Conference for Ecumenical Questions, attracting Catholic ecumenists to follow the World Council of Churches agenda and other developments. Several of these theologians later served as officials or experts for commissions at the Second Vatican Council. One of these specialists was a young Paulist, Thomas F. Stransky, who had been sent by his superiors to Europe for graduate study in Protestant missiology. Attending liturgy at St. Peter’s Basilica on Pentecost Sunday in 1960, when Pope John XXIII announced the preparatory commissions for the upcoming council, he was surprised to hear that among them was a secretariat for Christian unity. He had no inkling that before summer’s end he would be among the four members of the secretariat’s initial staff. The secretariat first gathered its bishop members, consultors and staff in November 1960. 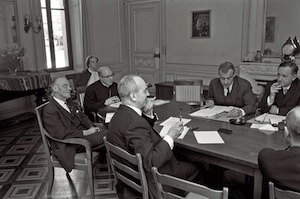 Only three of those who were present at that first meeting are alive today: Josette Kersters of the Grail Movement, whom Monsignor Willebrands had invited to help with secretarial work; Gregory Baum, then an Augustinian priest and now still active as a professor emeritus at McGill University; and Father Stransky. Father Baum was noticed because his doctoral thesis, published in 1956, scoured the works of the five popes before John XXIII for the slightest ecumenical inclinations. Father Stransky saw a copy of Father Baum’s book, marked prodigiously with reader’s notations, in Pope Paul VI’s private collection, which is now at the Instituto Paolo VI in Brescia. In November 2010 Professor Baum spoke at Georgetown University, marking the 50th anniversary of the secretariat’s first meeting. He reminisced that his thesis on “pre-ecumenical signs” would have been very different if he had written it only four years later, in 1960. With regard to the eventual declaration on the Jews, or what became “Nostra Aetate,” Professor Baum remembered his impression after its first meeting that the secretariat was going to offer a post-Auschwitz reading of the New Testament, avoiding “any interpretation of a biblical text that could legitimate the humiliation of the Jews and justify their exclusion or marginalization.” The secretariat’s work reached fruition in three conciliar acts: on ecumenism in 1964, on the Jews and interreligious dialogue in 1965 and on religious liberty in 1965. In collaboration with the theological commission, the secretariat also contributed to the “Constitution on Divine Revelation” of 1965. Contact with outsiders in 1960 also directed the secretariat’s work and affected the outcome of the council. On June 2, 1960, Monsignor Willebrands, by then the official ecumenical representative of the Dutch bishops, the first such national officer, was in Rome with Father Thijssen to report on C.C.E.Q. activities and plans. He records in his diary how Cardinal Bea told them that the pope would soon announce the secretariat and that he, Cardinal Bea, would be its president. He asked the Dutch priests to convey this confidential information to Geneva to another Dutchman, Willem A. Visser ’t Hooft, the first general secretary of the World Council of Churches. They were also to tell Dr. Visser ’t Hooft that Cardinal Bea wanted to meet with him soon, even if unofficially. Monsignor Willebrands and Dr. Visser ’t Hooft, already friends for several years, could mend any problem, conversing in Dutch. A private meeting between Dr. Visser ’t Hooft and Cardinal Bea took place on Sept. 22, 1960, at a convent in Milan. The local archbishop, Cardinal Giovanni Montini, was in on the plan too. As Pope Paul VI, Montini would guide the council to completion after the death of Pope John XXIII in 1963. In hindsight, the requirement that the meeting be secret seemed “ridiculous,” as Dr. Visser ’t Hooft later noted, but he agreed that the delicate process of establishing relationships could easily have been complicated by public discussion at that point. Dr. Visser ’t Hooft’s first recommendation to Cardinal Bea was that the council must address religious freedom to ensure that future Catholic statements promoting Christian unity would be taken seriously. More out in the open was the visit to Rome of Dr. Geoffrey Fisher, Archbishop of Canterbury, on Dec. 2, 1960. Monsignor Willebrands again served as an intermediary, conveying to Cardinal Bea Archbishop Fisher’s desire to stop for a meeting with Pope John after visits to Jerusalem and Istanbul. Anglicans and Catholics alike criticized Archbishop Fisher for wanting the meeting. Cardinal Domenico Tardini, the Vatican Secretary of State, toned down the visit—not allowing press coverage, photos or any official visit with Cardinal Bea. Again, good will prevailed over the awkwardness in establishing church relations. Archbishop Fisher reported that Pope John at one point read from an address, in which he referred enthusiastically to that time when other Christians could return home to Mother Church. The archbishop courteously corrected him: “Not return.... None of us can go backwards.” He then explained, “We are looking forward until, in God’s good time, when our two courses approximate and meet.” After a moment’s pause, Pope John replied, “You are right.” When the archbishop thanked him for establishing the secretariat, Pope John replied, “Yes, and this afternoon you shall see Cardinal Bea.” The reception was offsite at the college where Cardinal Bea lived. Even more significant for the outcome of the council was the visit to Rome of Jules Isaac, a week and a day after Pope John had announced the secretariat. An official of the pre-war French government and a Holocaust survivor, Professor Isaac had lost his wife, daughter and son-in-law in the death camps. He had dedicated his remaining years to dissolving Christian anti-Semitism and the pervasive anti-Jewish theology that supported it. There were interfaith meetings at Oxford in 1946, in Switzerland in 1947, the establishment of his own French association of Christians and Jews in 1948—all with Catholic participation—and a less-than-satisfactory meeting with Pope Pius XII in 1949. Unsure but encouraged by his Catholic friends, Professor Isaac had an audience with Pope John XXIII on June 13, 1960, and with Cardinal Bea two days later. The professor proposed that the pope form a commission to look at the problem, and the pope confirmed he was thinking the same thing. Pope John’s assurances gave Professor Isaac more than he had hoped for. In 1960 it came down to three 80-year-old men—a Holocaust survivor, a pope who had called a surprise council and a Jesuit cardinal and biblical scholar who headed the council’s most unanticipated commission. In September 1960, Pope John approved Cardinal Bea’s suggestion that a statement on religious relations with Jews could be written. By 1963, when the second session of the council got underway and the statement on the Jews was at last on its agenda, two of the three were dead. Cardinal Bea lived until 1968. Perhaps the greatest of his many achievements was guiding such a controversial statement as the “Declaration on the Relationship of the Church to Non-Christian Religions” to completion. The involvement of the Catholic Church in ecumenical and interreligious relations in the 50 years since Vatican II has been an enormously important factor affecting renewal of Christian life, ecumenical advances and greater interfaith mutuality. In his 1995 encyclical on ecumenism, “That They May Be One” (No. 78 and 84), Pope John Paul II acknowledged, perhaps more plainly than the bishops at Vatican II could have done in 1965, that the experience of ecumenism has enabled us to understand better how the Spirit is often able to pour out grace in extraordinary ways and how sublime is the mutual help Christians receive from one another in their search for the truth. Because of an editing error, an earlier version of this article misstated the place where Catholics represented only 2 percent of the population in the mid-20th century. It was in Oklahoma, not the entire United States. Only 50 short years ago, we Catholics were officially prohibited from becoming involved with people of other faiths, even fellow Christians. The blood-letting and vicious exchanges from the reformation, counter-reformation and many religious wars was still strong in memories. We were only just realizing the horrors of the Holocaust and anti-semitism witnessed so widely at the end of WWII. Today, we have permission to dialogue, meet and pray openly in ecumenical settings with both our Christian and non Christian brothers and sisters. I have been privileged to be a guest speaker in many protestant churches in our own local community. Our local newspaper features an every Saturday "voices of faith" page where faith leaders from many traditions present their answers to thought provoking questions - offering a multitude of insights. And most importantly, there are common ministries such as police and fire chaplaincy, service to the poor through interfaith shelters and food pantries, and public prayer opportunities where many faith leaders come together with their congregations. Now the next step, in accordance with the statement "For those who believe in Christ and have been truly baptized, are in communion with the Catholic Church even though that communion is imperfect" perhaps we might finally discover that it is possible to include many of the mainline protestant churches as actual "Rites" with their own hymnals, worship language and liturgy and common belief in the Lord's supper. At least then when we pray for unity we would no longer be crossing out fingers behind our back. Dave Pasinski is of course correct on the percentage of Catholics to the total U.S population in the 1950s. An illustrated pamphlet on the U.S. Church published by the National Catholic Rural Life Conference in 1955 was titled "32 Million Catholics" and noted that Catholics comprised "only" 20% of the population. John Borelli just may have accidentally dropped a zero. The Cardinal Bea Centre at Gregorian Pontifical University in Rome continues the work described by John Borelli.After retiring from my practice of Consulting Engineering, I studied in Rome and recieved from te Gregorian a Masters of Theology in Inter -religious Dialog, specializing in Islam.I was amazed at the commond ground between Islam and Catholicism epecially as Pope Benedict XVI pointed out, the admirable Muslim commitment to Prayer.It is regretable that primative tribal actions in Muslim communities are confused with Islam. Georgetown University can be proud of its leadership in Islamic studies under Prof. John Esposito and Fr. Daniel Madigan SJ ,who was my Department head , when I was at the Gregorian.When I returned home I , over two years attended more than fifty Adult Educastion Lectures at my local mosque(Westbury , LI). I know what American Muslims think .They are Pro-life, Pro -family, Pro-business , and Pro American. I believe John Borelli stated that the mid-20th century Catholic population of Oklahoma was 2%. The 2% refers to what I recall the Catholic population of Oklahoma was in the 1950s. This article also appeared in print, under the headline "In the Beginning," in the October 1, 2012 issue.